Feature film comedy vehicle for Johnny Carson regular Johnny Yune, a popular American-Korean stand-up, singer and TV personality. The humour is mostly based on broad stereotypes and features some honking one-liners, many of which are actually pretty good. “I got my black belt in the Orient. It was easy; only a written test,” that sort of thing. Yune plays a naive pan-Asian chef (the film is constantly jumbling up its Asian references and geographies) who inadvertently becomes a drugs mule for the Italian mafia when he is sent to New York with bags of flour which have been substituted for cocaine. This is used as a way of combining a road movie full of slapstick hijinks with some mild peril involving kung fu cops and rival gangs, a bit like The Cannonball Run (in which Johnny Yune also appeared). It also heavily references The Godfather as well as riffs on Saturday Night Fever and Rocky. 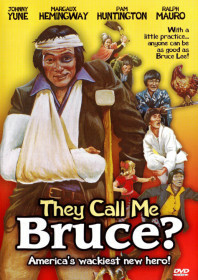 The title suggests a closer link to the films of Bruce Lee, but other than Yune displaying his affection for the late martial arts star by having posters of Lee on his walls, the title is used more as a device to highlight the ignorance of the people he meets. He also plays off the Asian stereotype by being useless at kung fu. His cartoonish attempts at avoiding violence result in the sort of slapstick routines that almost foreshadow Jackie Chan‘s more vulnerable, comedic approach to on-screen heroics. This has certainly dated and the action scenes are pedestrian, but Yune is a likeable presence; his comedy adds a different perspective to America’s immigrant experience.